Refreshing to see a sequel that’s an upgrade on the original and more thoughtful too. Find some fresh ideas and some brilliantly-executed pastiching in this riotous, arcade-game-inspired sequel. "First rule of the internet: Don't read the comments." A sane advice given by an algorithm named Yesss (Taraji P. Henson) to the muscle-bound hero and victim of online comments, Wreck-It Ralph (John C. Reilly). It is a moment where Ralph reads all the comments posted under a series of videos he created for a YouTube-like site. They pile up in real time, one on top of the other, and the vast majority are deliberately hurtful. Although he tries to shrug off the pain, he is visibly disturbed. A moment in the film that resonates with practically everyone in the audience. This and many moments like this in the movie are inspired by the life lessons one acquires after spending enough time online, especially if you create anything online and have thousands of reactions from people online. 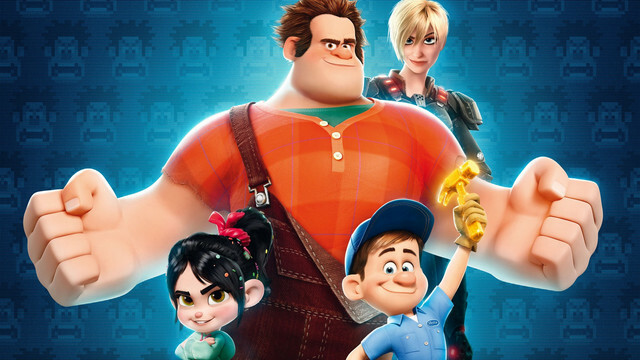 Wreck-It Ralph brought us a 16-bit wonderland fit to blow the synapses of bright-eyed kids and weathered gamers, and this vibrant follow-up is a giddy, sugar-coated expansion pack that plugs in ideas about friendship, insecurity and the mind-bending transience of the online world. You also find an eBay-spoofing riff involving a corn chip shaped like Beyoncé. In Wreck-It Ralph we watch a video game bad guy with an existential crisis, and a number of smart jokes about video games and gaming culture. 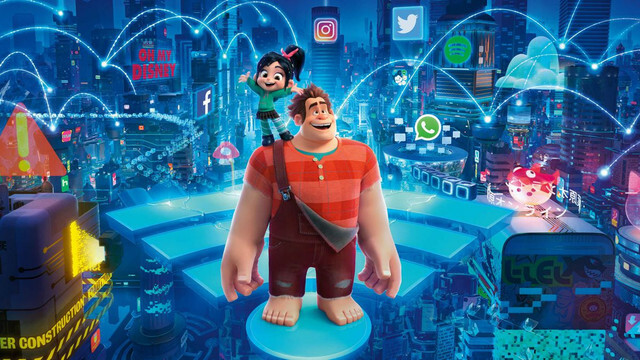 Ralph Breaks the Internet expands that idea and applies it to cyberspace. After accidentally breaking the video game home of his best friend Vanellope von Schweetz (Sarah Silverman), Ralph goes online with his friend to find the part they'll need to repair the damaged arcade machine. And even as they both try to raise the money required to buy what they need, Vanellope is tempted to abandon the mission and join a game called Slaughter Race. The new game can provide her with a breadth of new experiences as well as the mentorship of a top racer named Shank (Gal Gadot). It is then that Ralph does something bold. Instead of driving its plot with a villain (the movie doesn’t have one! ), the forces working against Ralph and Vanellope are shown to be confined to their inner struggles. Ralph is struggling with his fear of losing Vanellope once she moves on to other things in her life. Vanellope on the other hand is unsure about making changes that could result in her finding happiness but which could also cause her to fail. The film does not shy from exploring the painful truths that people have to face when confronted with dilemmas. It argues, with a maturity that even many adult films lack, that one can have a happy ending while accepting the bittersweet that comes with life. Showcasing nuances of relationships we treasure the most and that need to evolve, and perhaps can do so at a distance where they can meet their own needs. And that, to grow as human beings we need to embrace our fears and not run away from it. Ralph Breaks the Internet presents these life lessons quite poignantly for children without being preachy and melodramatic. 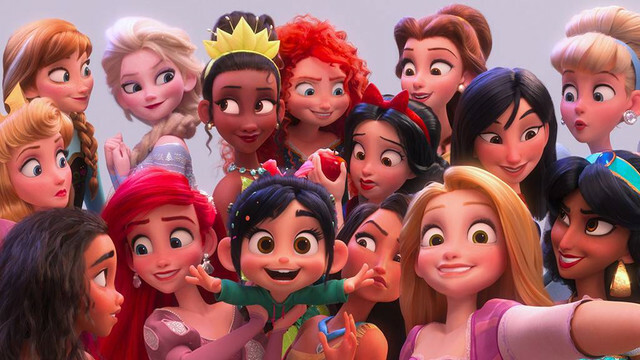 And that is where Ralph Breaks the Internet works. In the first movie, Ralph learnt he was more than a bad guy. In this one, he learns that it’s okay to want variety and stand out from the crowd. The film has a lot to say about how the internet brings out the best and worst in people, and in the process becomes a wonderful film appropriate for all ages.